A CWCI Spotlight Report examines the impact that the Medical Treatment Utilization Schedule has had on the types of medications dispensed to injured workers and recent shifts in the total drug spend. CWCI's analysis of changes in the types of prescription drugs used in California workers' compensation over the past decade. 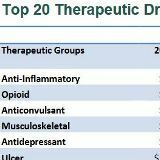 The report looks at the breakdown of prescriptions and payments by therapeutic drug group by service year, as well as the generic utilization rates for the different drug groups and how the average amounts paid for drugs within each group changed over the 10-year study period. Independent Medical Review Volume and Outcomes Through Q2 2018. For further details see the news release in the Newsroom and CWCI members and subscribers may log in to view a summary Bulletin and the Research Update report. A study that uses 2016 - 2017 California workers' compensation prescription data to determine the prevalence of polypharmacy in the system and to identify the types of drugs used in polypharmacy prescribing. Using data from 141,643 pharmaceutical requests and UR decisions from the first five months of 2017 and 2018, and 58,604 IMR decisions from the first four months of those same two years, CWCI takes a preliminary look at changes in pharmaceutical UR and IMR outcomes in the first few months after Californias WC Formulary took effect. CWCI research measures and compares changes in the volume of inpatient hospitalizations in WC, Medicare, Medi-Cal and private plans from 2008-2016, notes the most common WC inpatient diagnosis-related group codes (MS-DRGs) and the top 5 Major Diagnostic Categories (MDCs); and provides detailed data on other workers compensation inpatient trends, including average length of stay and changes in the volume of implant-eligible spinal surgeries. An online application that CWCI members can use to examine and compare industrywide prescription drug data derived from 12.5 million prescriptions dispensed to injured workers between January 2007 and June 2017. Recent data on the IMR process for resolving workers comp medical disputes. measuring changes in IMR volume in 2017, and comparing IMR outcomes based on a review of 648,450 IMR decision letters issued from 2014 through 2017. A CWCI Research Update report shows changes in California workers' comp prescription drug and payment distributions by therapeutic drug group and provides detailed information on the latest opioid trends. A CWCI white paper that examines the issues, opportunities, and unresolved problems surrounding the integration of California workers' comp into a 24-hour system. This study tracks changes in the composition of the Qualified Medical Evaluator (QME) population in California workers' compensation in terms of medical specialty representation and geographic availability, comparing data on medical providers certified as QMEs in 2012 and in 2017. The study also uses 2007 - June 2017 claims data to examine changes in the level of services rendered by evaluators, the mix of services, average payments for all medical-legal services and for specific levels of service, and the proportion of evaluations performed by AMEs vs. QMEs. CWCIs analysis of the prevalence and cost of prescription drugs within approved Workers' Compensation Medicare Set-Aside Arrangements. An interactive application based on updated IRIS data on claims from the last decade (AY 2007 through 2016) so that users can compare results from each region to statewide results on key metrics, compare results between different regions, and identify regional and statewide trends that have developed. CWCI members can now access a new interactive application that shows average paid indemnity and medical losses on claims from AY 2005 through the end of AY 2016 at nine levels of development (with payments valued through December 2016). The online tool gives Institute members the ability to view results for indemnity claims or for all claims, subset the data by industry and region, and segment the medical payment data into medical treatment, pharmacy & DME, medical-legal services & medical cost containment expenses. An analysis of the volume and outcomes of Independent Medical Reviews based on determination letters issued from January 2014 through June 2017. A CWCI analysis of the prevalence, volume and strength of opioid prescriptions in California work injury lost-time claims that involve a mental health component. A CWCI Spotlight Report uses 2015 and 2016 workers' comp prescription drug data to measure the potential impact of DWC's proposed Formulary. A new analysis on the use of ICD-10 codes in California workers comp during the transition from the ICD-9 system finds that 99 percent of submitted medical bills used ICD-10 codes and, as expected, a wider range of codes were provided than in the past, but many lacked the additional characters that better define the injury, identify the type of encounter and improve communication. Claims filed by workers living in the Sierras represent just 1.7% of California workers' comp claims, but over the past decade average loss payments in the region have grown faster than in other parts of the state. CWCI's final Regional Score Card takes a close look at key aspects of Sierra claims and compares the results to those from other regions. 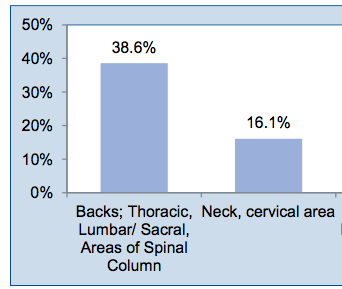 CWCI's analysis of the utilization trends, costs, and characteristics of spinal fusion claims in California workers' compensation.